You can either embrace every opportunity like Eve (Tilda Swinton) and soak up all that culture has to offer. Or you can sink into a stultifying depression like Adam (Tom Hiddleston) as you watch humanity destroy the planet and themselves. Either way, it’s not easy being a vampire - for this is what Adam and Eve are. Click Here For Our Free Weekly Newsletter! As I started to watch Jim Jarmusch’s Only Lovers Left Alive, I was aware that the film had received conflicting reviews. Some loved this deeply romantic and atmospheric story of two vampires. Others found the movie to be unbearably slow and dull. I am firmly in the first camp. I agree that Only Lovers Left Alive is short on action. I agree that very little happens. And I agree that this film is a slow burner. I do not agree that it is dull. I was never bored and felt engaged throughout. However, I do think that you have to be in the right mood and have the right frame of mind to enjoy Only Lovers Left Alive. It just so happened that I was in the perfect state to enjoy this film. I was happy to let things develop slowly and let others wash over me. I didn’t mind the lingering shots or the laid back pace. For me, they were perfect - the film has all the time in the world because vampires have all the time in the world. The cast are superb. Tom Hiddleston turns in a perfect performance as Adam. You feel his romantic despair and hopelessness. However, you also feel his intense love for Eva - possibly the only reason for his continued existence. Tilda Swinton is Tilda Swinton - and by that I mean she is perfect and utterly mesmerising. She looks otherworldly and I really felt that she had been alive for centuries. Mia Wasikowska plays Ava, Eve’s sister, and injects some spark, action and danger into proceedings. I could have done with more of her dangerous and chaotic character. There is a good deal of humour running through Only Lovers Left Alive. John Hurt plays Christopher Marlowe for a start and much is made of the fact that he actually wrote the plays attributed to Shakespeare. Meanwhile, if you love beautiful instruments you will love this film. Adam collects antique guitars and mandolins and they are gorgeous. The film’s soundtrack, by Jozef Van Wissem is also wonderful. 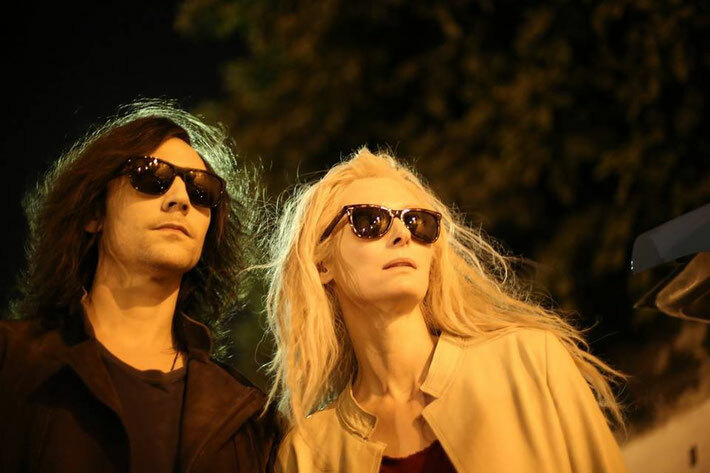 I really enjoyed Only Lovers Left Alive. If you are in the mood for a atmospheric and deeply romantic vampire love story I would suggest that you forget Twilight and watch this instead. Am now listening to the soundtrack of Only Lovers Left Alive… it’s pretty good I think. Interesting to see Tom Hiddleston in this role after seeing him in Crimson Peak - again with Mia Wasikowska. Have you seen Only Lovers Left Alive? If you have, let me know what you think of this film in the comments section below!